Support a people under siege. Learn from leaders who call out hate. Promote courageous dialogue in any conflict. The humanitarian crisis of the Rohingya people rages on. Government forces have violently driven nearly one million people, mostly Muslim, out of Myanmar and into refugee camps in Bangladesh. And a faction of ultra-nationalist Buddhists backs the military’s brutal suppression—now being investigated as genocide. Hozan Alan Senauke, Vice Abbot of the Berkeley Zen Center, will facilitate the panel discussion. He is co-founder of the Buddhist Humanitarian Project, which is dedicated to supporting the Rohingya refugees. Funds raised at the conference will go to BHP. Following a short meditation period, panelists will present on the current situation in Myanmar and their work to help the Rohingya people. After lunch we'll explore the roots of extremism and how to promote courageous dialogue in times of division and hatred. There will also be opportunities to support the Buddhist Humanitarian Project and its work in relieving the suffering of Rohingya refugees. Net proceeds go to the Buddhist Humanitarian Project. Lunch is included. Various ticket options are available for purchase here. Boulder Shambhala Center, 5pm, FREE! The evening before the conference, please join us for a special screening of the acclaimed documentary The Venerable W., which provides much insight into the ongoing crisis of the Rohingya people. The film intimately and graphically illuminates the views and influence of Venerable Ashin Wirathu, the firebrand monk inciting unspeakable violence. Following the screening, there will be a reception with light appetizers and drinks and a Q+A with Sunday’s panelists. 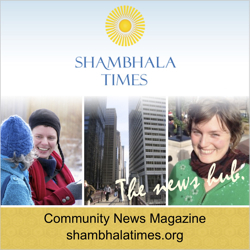 These events are presented by the Boulder Shambhala Center and sponsored by Boulder Weekly and Naropa University.